What's the most ununsual piece of environmental art that you've ever seen? 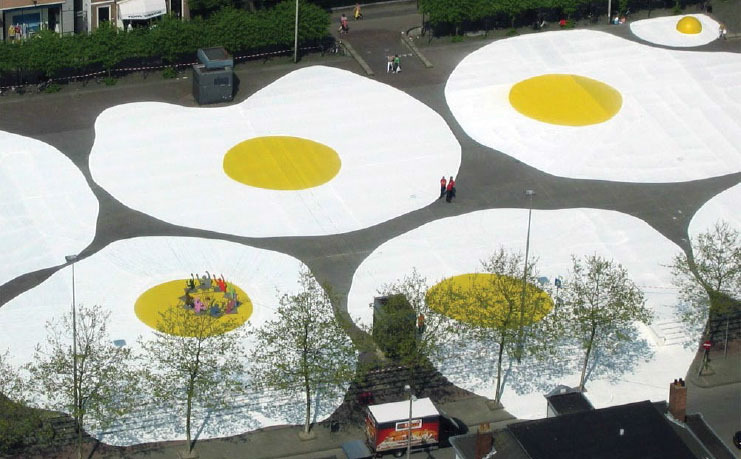 In 2008, artist Henk Hofstra, “inspired by his breakfast”, created a series of enormous egg sculptures in the centre of Wilhelmina Square. Called “Art Eggsident,” (like “art accident”) many of the eggs were over 30 metres wide. The egg art was popular with kids, who enjoyed climbing up the 2.3 metre tall sculptures. The enormous eggs had bloggers talking too. One person said, “I love it, but it does need bacon. And toast. And coffee.” Another blogger said she hope Google Earth would pick up the eggs on satellite.